1000 lbs of dirt from Paradise, Nevada, aka "The Strip", loaded in the back of a truck and delivered to Reno, Nevada. From the heart of a miraculous metropolis in the desert, comes a group producing modern-day marvels. The Traveling Miracle Show doesn’t claim to offer a cure-all elixir for rheumatism, baldness & bad breath, but it does promise an evening of astonishing spectacle and miraculous events. The intrepid viewer may encounter mystical beasts, a human cactus, melancholic black bile, an infinite fountain of alcohol, the root of good and evil, and a ‘sin-eating’ delicacy. This project has been funded, in part, by the Nevada Arts Council, a state agency, and the National Endowment for the Arts, a federal agency. 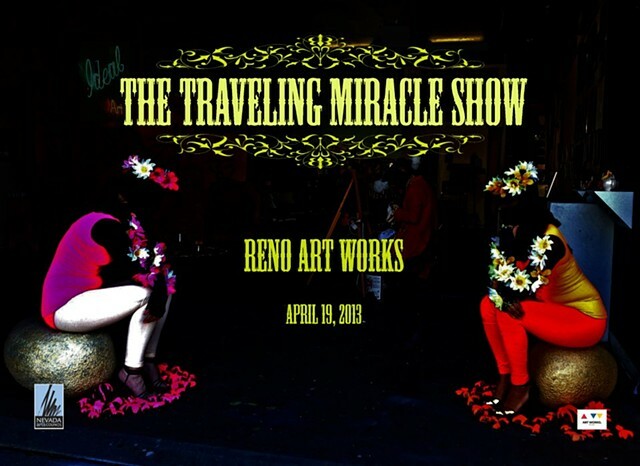 With the assistance of this grant, the artists will be taking The Traveling Miracle Show on the road in Nevada, with the event scheduled for Reno Art Works in mid-April.